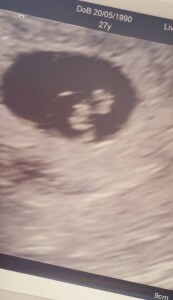 I found out I was pregnant in the March and I couldn’t have been happier and when I told my soon to be husband I cried so much I think I near choked. I had some problems at first but everything seemed to iron out and on my first scan they could see 2 babies! I went again for a check up after the complications and confirmed 1 baby – measuring at around 11-13 weeks and I got to see their heartbeat measurement on the screen… I felt a love I’d never ever imagined I could feel. The next day I had to pay privately for a midwife to scan me to confirm my loss.. In a cold room with a woman I’d never met before. My world was shattered and I’d never felt sadness ever like this before and I don’t believe I ever will again. My little baby was going to be brought into the world by planned c section due to some health complications and surgeries I’d had which meant that natural birth could have complications for me. They were planning to bring me in for a c-section on 24/12/2017 to welcome our baby to the world. This is also the same date as my grandfather’s birthday. This year my baby will have been born so I plan to remember him by being with my family on Christmas eve and letting his place in the world be known.